Hope you had a good Easter and that you are enjoying the warmer weather overseas? We are approaching winter so it is getting a little chilly which I love because it means more stitching time! Funny how we always discuss the weather – as my husband once pointed out it is only the difference between a warm jacket and a drink in the pub or a pair of summer shorts and a live game of rugby! Men can be so simple?? This week it is my great pleasure to introduce to you Mical Aloni. I have mentioned her in a previous post here – but as I said at the time I was unable to make contact with her – she seemed to have dropped off the face of the earth, but lo and behold she emailed a few weeks ago, to say that she had had twins and been busy for a while but is now back in circulation. 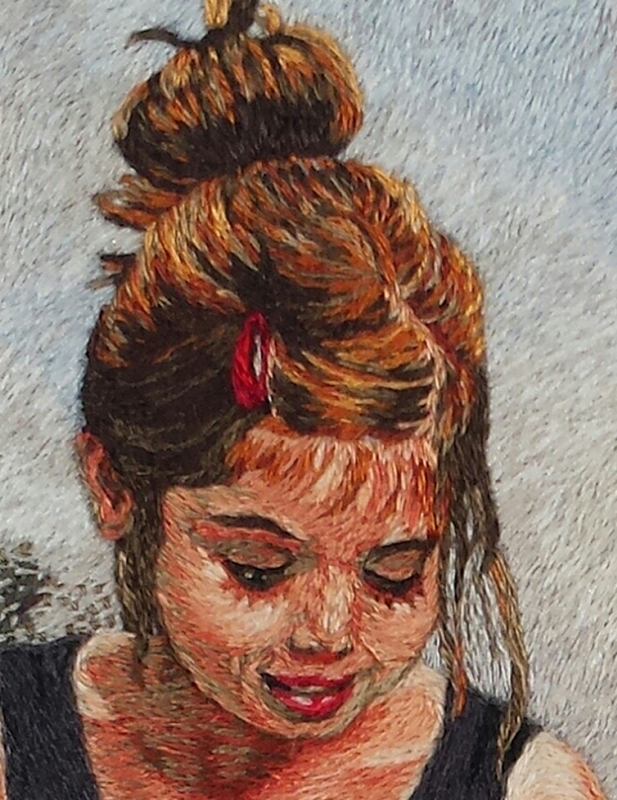 Mical is without a doubt an embroidery artist of the highest degree – she does the most exquisite miniature needlepainting embroideries, approx 2.5 – 6 inches in size, really quite unique. Last week I interviewed Mical – and found her story absolutely fascinating. It is one of empowerment and inspiration for all of us embroiderers, proving that humble beginnings can lead to great things. 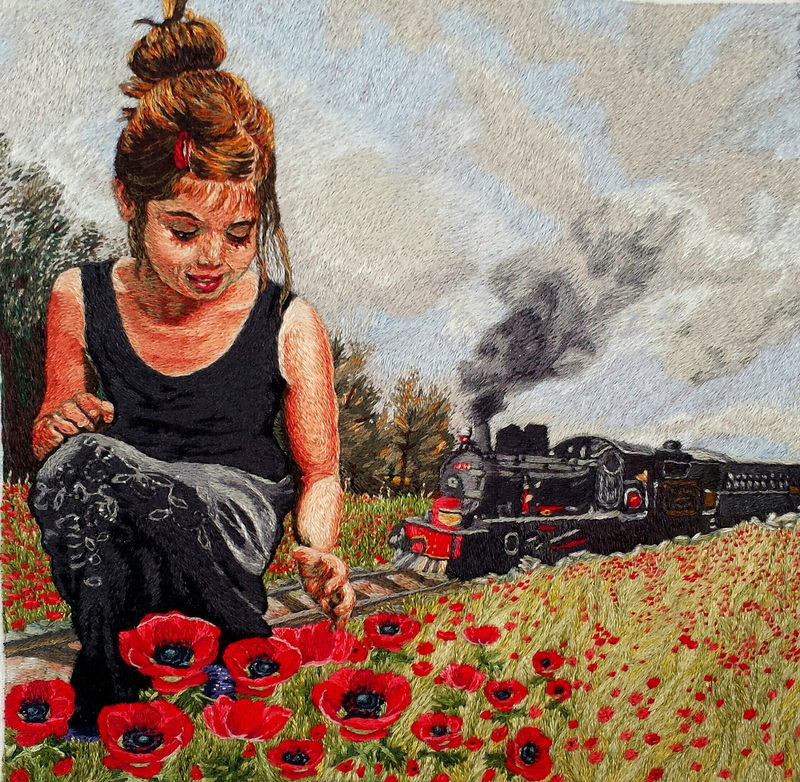 Her innate style of embroidery has blossomed from simple dabblings as a young girl in a Kibbutz in Israel, and grown into what is now recognized by the world as “Fine Art”. I found the fact that she uses a “long skinny needle” and “cheap white bed sheets” so interesting – proving that we don’t need the finest materials to produce a beautiful piece of art, the desire to stitch and create overcomes all limitations? I am sure you will love Mical’s relaxed and informal chatter – I did have a giggle at the way she sometimes described things! 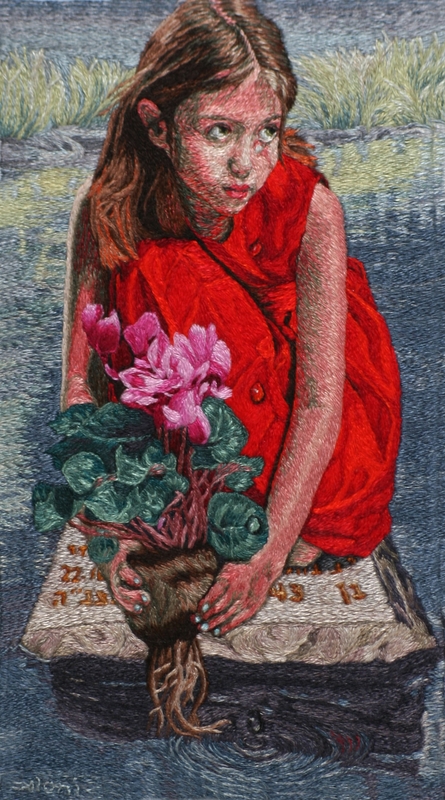 While you sit in your comfortable living room stitching away you can pause to consider the odds she overcame to fulfill a great need to create things of beauty with needle and thread. You can read the interview below and see more examples of her work here: Mical Aloni. Mical I know that you started to embroider whilst at an agricultural Kibbutz in northern central Israel, please tell us more about this, what inspired you to create such a unique style of embroidery contrary to what others at the Kibbutz were doing – I believe the norm was cross stitch? Ever since I can remember myself, my hands where occupied in creating something. As a girl growing up in a Kibbutz I was introduced to embroidery early on, and though I proved to be a complete failure in decorating table clothes and napkins with cross stitching, I found that I can use thread as paint and in an environment where art supplies where scares, that was a discovery indeed! 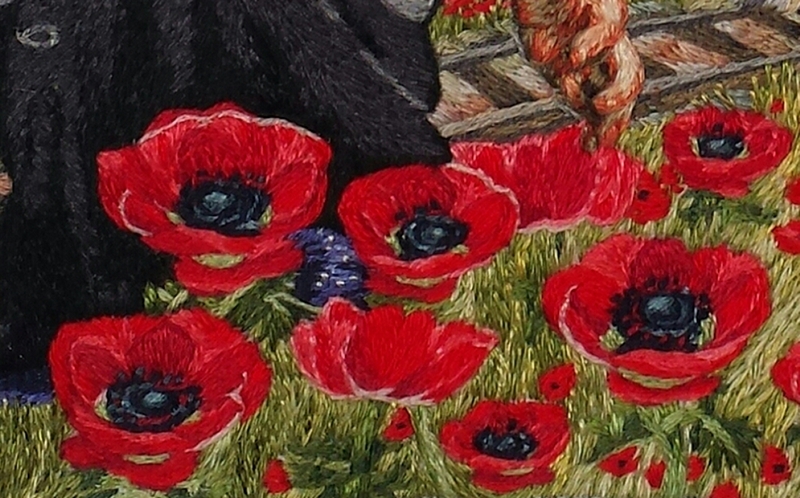 How did your embroidery help escape the intensity of military life whilst serving your mandatory two-year military service? Can you tell us of any experiences during this time? During my 2 years’ service in the Israeli army I had an ongoing piece of embroidery; in the end I think it measured 1×1 foot. It was filled with colourful magical creatures and help me withdrew from the toil of military life to a wonderful world all of my own. Unfortunately this piece is lost. I believe that at the age of 25 you moved to the US where you earned culinary distinction at the Academe de Cuisine in Maryland, and then went on to own a successful restaurant, Franzi and Nells, located in Stony Brook on Long Island, New York? You must have been fully occupied running your restaurant, did you still have time for embroidery? As during my army service, embroidery provided me with a necessary respite from my busy days of a chef and restaurant owner. At that point I gifted them to my friends. In 1994 you moved to Taos, New Mexico – presumably this was when you began to embroider full time. What was it that inspired you to start creating these miniature pieces? Approx what size are your pieces of embroidery? I entered the “Taos Open” show in the spring of 1997 and got myself a ribbon and the attention of the late and wonderful Steve Parks owner of the Parks Gallery, and the rest is history. 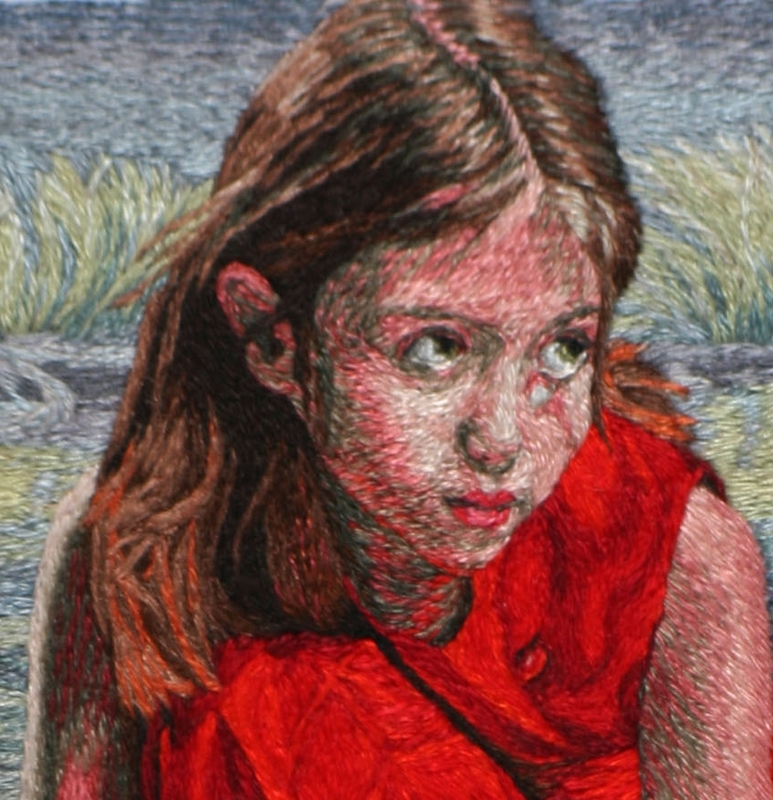 Your embroidery pieces have attained phenomenal success, being exhibited and sold by art galleries in New York and Taos and now housed as a permanent collection of the Harwood Museum in Taos and the American Craft Museum in New York. What a wonderful progression and certainly a great achievement – from humble beginnings come great things! It is unusual for thread painted pieces to be acknowledged as “fine art” how was your work first recognized at this level? I always thought about my work as fine art and was rather surprised to find myself in the art versus craft debate. When I crate a piece my primary concern is line, shape, balance, colour, form, space, texture, etc. The fact that I’m most comfortable using embroidery to create those pieces is almost incidental. I have noticed that most thread artist emphasise their use of thread, I infact try to make it disappear: when one listen to a great violinist play, one does not think about the difficulties of playing the violin (which is very hard indeed), but instead hear the beautiful music. I want my audience to forget the technical challenges of embroidery and just enjoy, be inspired and be moved by the art work. I do find the distinction between the art and craft redundant. Where does the inspiration for your unique ideas come from? Are they mainly photographs and if so are these photographs that you take yourself and then decide to stitch or do you have a source of photography? My latest body of work is called Fragile: Sparks of a Dream. Here is something I wrote about it (even if it’s written in a third person manner). Mical Aloni’s most recent collection is inspired by memories and dreams from her childhood on a kibbutz in Israel and features her twin daughters Maya and Rumi in contexts that highlight the fragile beauty of childhood in a changing and sometimes dangerous world. 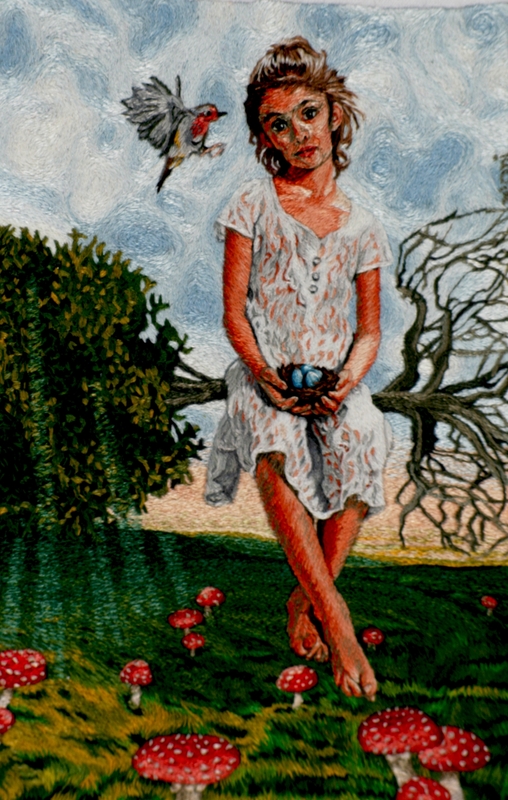 These embroideries lend themselves to a magical realism style. This is a collection that has allowed Aloni the opportunity to present the most authentic and honest work she’d ever created, as she has chosen to step outside of the preconceived notions and restrictions she had once placed on her work and taken the steps to express her true self through her work. She is excited to unveil it to the public after having taken almost a decade off to raise her girls and to gain the inspiration that can only come from motherhood. I do work from photographs; I take them all the time and keep them for later use. When I have an idea for a piece I usually rent a real photography studio and take my subjects (at this point mostly my girl) there and torcher them…. Haha. I compose my images in Photoshop and create something that resembles my final project. Close up of Mical’s stitching. For the benefit of our readers I would like to ask you a few questions on the actual embroidery process I know that you find it difficult to explain your technique as it is not in essence the traditional style of long & short stitch, more like a series of staggered satin stitches? You mentioned lately that you gave a talk at a Woman’s Institute and found it challenging to answer their questions,( I can empathise with this as am self- taught and don’t necessarily follow the formal method of long & short stitch ) so I will go easy on you! Can you explain a bit about how you stitch? Do you work one shade of colour at a time and blend this in with the next or do you place stitches randomly as if you were colouring with pencil crayons? About how long are your stitches? I work on one little area at the time: be it an eye or a nose or a shoe. The artistic challenge is that I work “against’’ white, so I have to compensate for that, and plan my colours carefully in advance. I usually don’t attempt to do more then 1/4-1/2 inch square at a time. I might be working with 5-20 colours at a time. Depending on what I work on, I might do 1 stitch or 10 at a time and then go to another colour, it really depend on what I try to achieve. I usually start with the very dark hue and very light hue and then fill with the medium hues. The stitch size varies from a dot to a straight stitch no larger than 3/8 of an inch length. Long stitches tend to be able to move and therefore not accurate enough. I really do not limit myself to any specific way. I stay open to whatever is the best approach to a specific colour or texture. After almost 40 years of embroidery I still find new challenges in each piece and have to figure the right way to approach it. What fabric do you use and do you trace an outline onto your fabric before stitching or do you have some other method? I use a cheap white bed sheet, not the ones that have a million thread count but the ones that do not. One sheet goes a long way…. I use a pencil for the outline, I press it with very hot iron to set it. Do you use a hoop to stretch the fabric or do you stitch with the fabric loose in the hand. Yes I do. I use the plastic light blue ones. I can’t do anything that’s bigger then what fits in a 10 inch hoop. Does anybody know if they make 9 inch hoop? I could never find one. Do you have a specific type of needle and thread that you use? I use a very long and skinny needle… the longest and skinniest I’m happiest. I use mainly Anchor cotton thread, the stuff that come in a strand of 6. I use a single strand at a time. I also use Spendor 12-ply silk, again 1 strand at a time. Its a very beautiful thread and has great coverage but the color range is not that great.. I use the gray scale of DMC because its offers a good color range, however the DMC thread tends to fray quickly and become dull with use. Thanks so much for agreeing to do this interview with us Mical, I have had the opportunity to get to know you a bit recently and know that you are a very humble, down to earth person that any of us can easily relate to! 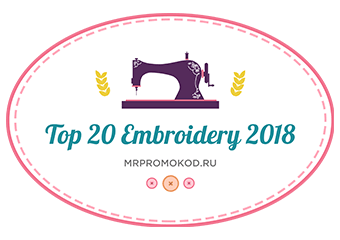 I am a great admirer of your work and wish you continued success and many happy hours growing and creating your beautiful pieces of embroidery. Thank you Trish for sharing Mical’s story. Her work is beautiful, I can see why it is ‘fine art’. Mical ask if anyone knew of or where to find a 9″ hoop. Nordic Needle has a 9″ hoop, No-slip by Morgan. http://www.nordicneedle.com/prod/6938A.html is the direct link.